Millard Canyon Falls holds a special place in my hiking heart. 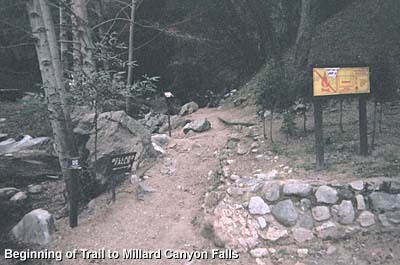 On a Friday afternoon in April 1995, two friends from work and I took a long lunch hour and enjoyed a delightful saunter to Millard Canyon Falls. Two weeks later I purchased John Robinson's Trails of the Angeles, launching a love in me for hiking the San Gabriel Mountains. Secluded from the mega-metropolis of the L.A. Basin, woodsy Millard Canyon offers a sylvan sanctuary for the weary urbanite. The sparkling stream gurgles and glides over lovely boulders under a dense canopy of sycamore, alder, and oak. Lush green plants and flowers adorn the setting. A half-mile route meandering along the rocky creek bed leads to the base of the 50-foot falls. This shady lair invites you to relax and be refreshed as you experience its beauty and charm. In 1819, young prisoner Joseph Chapman, was found to have lumbering skills. So the Spaniards sent him with a party of Indians to cut lumber to build the Plaza Church in Los Angeles. He found a local canyon well suited and he effectively lead the lumbering operations to acquire all the lumber needed. He soon earned a reputation as a skilled lumberman. In 1831 he was called upon to cut timber for building a schooner for William Wolfskill, who would use it to hunt sea otter. Once again Chapman recruited Indian laborers and went back to "Church Canyon" to cut lumber. He directed the construction of the 70-foot, 60-ton schooner, which was then transported in pieces by ox-cart to San Padro. Chapman named the ship Guadalupe, after his California-born wife. For many years historians did not know the location of Chapman's "Church Canyon." Then in 1895, local historian Hiram Reid discovered in the upper reaches of Millard Canyon the evidence of Chapman's early logging venture, and the mystery was solved. Millard Canyon is named for Henry W. Millard, who homesteaded in the mouth of the canyon with his family in 1862. He raised bees and hauled wood to Los Angeles. He left the canyon about 1872 and moved to the Downy area. Two graves near his rustic cabin are thought to be the resting place for his wife and child. Early Altadena resident Joshua Giddlings, whose family had settled in the mouth of Millard Canyon in 1878, claims that a five-foot diameter stump from a big-cone Douglas fir on the east slope of the canyon was used for the keel board of the Guadalupe. Millard Canyon also became known for its gold mining. The historic Dawn Mine (worked intermittently from 1895 through the early 1950s) was one of the most storied mines of the range (See my Dawn Mine page for more). This hike certainly can be enjoyed all year long, but the span from after the first good rains of the season through late spring offer the best time to enjoy the falls. In the dead of winter, many of the trees along the canyon bottom will have lost their leafs, giving more openness to the trek, compared to the dense shade of summertime. View Seasons of the San Gabriels for a detailed description of minding the seasons. From the I-210 Foothill Freeway in Pasadena, exit at Lake Avenue. Drive north (toward the mountains) for 3.5 miles to the end of Lake Avenue. Turn left (west) on Loma Alta Drive and drive 1.0 mile to Chaney Trail (marked by a blinking yellow light). Turn right and drive north on Chaney Trail. You'll pass through a gate that is locked from 8:00 p.m. to 6:00 a.m. After a winding 1.1 miles you reach Sunset Ridge. Turn left and drive 0.5 mile down to the large parking lot. The hike begins near the entrance to the parking lot. A National Forest Adventure Pass is required to park. From the parking lot follow the broad path north through the campground to the beginning of the creek route, just past the camp host site. A sign, "Millard Falls" points the way to the right. Immediately you will climb over a short check dam and start up the creek. The well-worn path crosses the creek a half dozen times along the your half-mile canyon bottom scramble. As you near the falls you'll probably hear them before you see them. This is a popular hike, so you may have to share this charming retreat with others. Return the way you came. Millard Falls - 1-24-06, 3:25 PM. The late afternoon sun, allowed in by the leafless winter trees, highlights the image. A dry winter produces a less-than showy display. 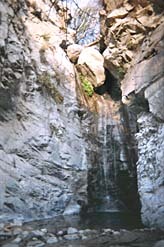 Robinson begins his write-up for Millard Canyon Falls by stating: "Of the two dozen or so real waterfalls in the San Gabriel Mountains, only four are readily accessible to the leisurely stroller. 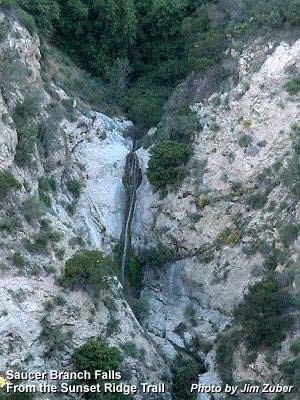 Millard Canyon is one of these" (Read more on my Waterfalls page). A set of falls that Robinson does not mention is the Saucer Branch Punchbowl, just a half mile up the stream from Millard Canyon Falls. These impressive multi-tier, 70-foot waterfalls are easily seen (in fact, hard to miss) from a distance from the Sunset Ridge Trail and fire road, but getting to them is not so easy. 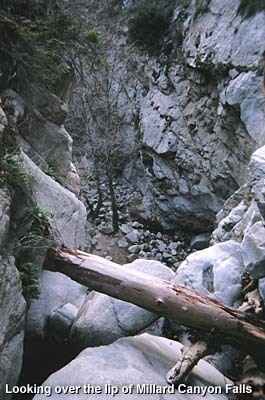 The primitive 100-yard path from the main Millard Canyon stream bed is precarious and inundated with poison oak (not easy to detect in the winter when it has lost its leafs but is still toxic). Visiting Saucer Branch from Millard Falls is recommended for only the experienced outdoors person with skills in off-trail hiking. If that's you, here's how to get there: From the base of Millard Falls, head back down stream about 100 yards to a white steel post on the left (south bank). Notice the steep path that veers right, ascending the slope. This is your route. The footing is loose so proceed with care. In a couple minutes the route cuts back left to follow a well-used path high on the south canyon wall above Millard Falls. The path is narrow and canyon steep so watch your step. You find another white steel post as your reach the high point above the falls. The path then drops down to the creek behind the falls. Use caution if trying to get a better look over the fallsThe rocks can be slippery and the water swiftTo tumble over the 50-foot falls to the rocks below has unthinkable results. From the top of Millard Falls, follow the creek upstream, boulder hopping as you go. You'll notice that others have followed this route. In about 6 to 8 minutes you will see a cabin high on the south bank (right) with a trail zigzagging down to the creek bed. This is the main trail coming down from Sunset Ridge to proceed up creek to Dawn Mine (you may use this as an alternate route going back). As you continue up stream in an eastward direction, at first the route may appear to be a jumble of boulders. But as you press ahead you will soon see emerge an informal but well-used path. You'll cross the creek several times in less than a quarter mile and reach a junction where the canyon branches. You see a tributary coming in from the north. This is Saucer Branch. About 100 yards up that stream is the base of a series of majestic waterfalls. You cross Millard creek to begin this route, then immediately cross left to the west side Saucer Branch creek, then a minute later cross back over to the east bank. The primitive path angles up a steep, loose slope and is precarious in places. The abundance of poison oak may deter your progress (it's okay if you decide to turn back). In a couple more minutes you arrive at the base of Saucer Branch Punchbowl, so named for saucer-like pool at the bottom of the multi-tiered falls. Unless you are readied with technical climbing skills and equipment, don't attempt to climb the falls beyond the pool. Bask in the beauty of this setting, then return the way you came. Alternate return route: This optional course adds a couple miles to your trip, but will reward you will nice views of Saucer Branch Falls on your ascent from the canyon bottom. After leaving Saucer Branch and heading back down stream, in less than a quarter mile, look for the trail zigzagging down from the left (south) bank near the cabin. Take this trail. Almost immediately you pass a quaint cabin on the left, cross a rustic footbridge and arrive at a trail junction. The left fork is the signed Sunset Trail, but you will veer right and follow a well-maintained trail. Periodically look back across the canyon to enjoy views of the Saucer Branch Falls. In about 1 mile from the canyon bottom you reach the Mt. Lowe fire road running along Sunset Ridge. Turn right and follow the paved road about 300 yards to a junction. On the left (south) is a sign-in box and a Mount Lowe historic informational sign. On the right is a sign that reads "Altadena Crest Trail," pointing both ways along the road. Next to it is a trail heading down (north) into the canyon. Take this trail, which nicely meanders down the slope to reach the Millard Campground parking lot in .08 mile, where you should find your car. - Hike to Punchbowl Falls - Report and photos by Paul Ayers (11-27-99). - Saucer Branch - Adventure hike description by Christopher Brennen. Includes topo map and photos. Millard Canyon Trail - by Tom Chester and Jane Strong. Good hike description, brief history, links, and lots of other info. AltadenaTrails.org - Information about Hiking, Mountain Bike, and Equestrian Trails in the Altadena Foothills. Trails of the Angeles: 100 Hikes in the San Gabriels - by John Robinson with Doug Christiansen (Wilderness Press, Eighth Edition, April 2005). Hike 20: "Millard Canyon to Millard Canyon Falls." Short trail description. Afoot and Afield in Los Angeles County - by Jerry Schad (Wilderness Press). Area A-5, Trip 7: "Millard Canyon Falls." Brief trail description. Los Angeles County: A Day Hiker's Guide - by John McKinney (The Trailmaster, 2006). "Millard Canyon, Dawn Mine." Brief historical background and short trail description. He combines his write-up with a hike to Dawn Mine. Previously published in Wild L.A.: A Day Hiker's Guide (2003), now out of print. Correction: In his description of the Sunset Ridge Trail descending into Millard Canyon, he says, "the path will reward you with a view of Millard Canyon Falls." Actually, this is Saucer Branch Falls. Millard Falls is not seen from this trail. California Waterfalls - by Ann Marie Brown (Foghorn Press, 1997). A guide to 200 waterfalls in California. 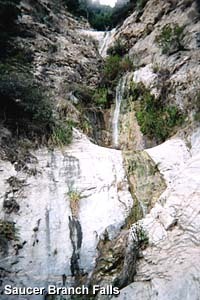 She writes up 14 waterfalls in the San Gabriels and gives Millard Canyon Falls a rating of 8 (6=good, 7=great, 8=excellent, 9=spetacular 10="Top 20 in California"). Brief trail description. This page was last updated March 19, 2016.